Manual stamping will do the same job as the "electrical stamping", manual is just more laborious and time consuming. >stretch marks are very wide and deep. I suggest the combination of a regular 1.5 mm dermaroller + 1.5 mm dermastamp with 35 needles + our 0.1% Tretinoin cream. A 1.5 mm dermatmap. If the scar has hardened collagen (tough scar tissue), apply also the Tretinoin cream. Do not use the same tools for you face and for your body. You are treating large areas on the body and that will blunt the needles quicker. Buy separate dermaneeding instruments for the face. Dermarolling / Microneedling / Re: 1mm Derma Stamp Or a 1.5mm Derma Stamp? Dermaneedling often thickens the skin, so a slightly more difficult penetration is not too unusual. The 1 mm dermastamp definitely penetrates into the dermis but it does not reach the deepest parts of the dermis. All scars are in the dermis. Shallow scars are in the upper part of the dermis. A 1 mm dermastamp should be enough in your case. Nevertheless, you can buy a 1.5 mm size too. Or buy a 1 mm now and when it gets blunt, go for 1.5 mm size. I am sorry I have not replied yet but I am really busy. I will reply as soon as I can. I do not recommend it due to discomfort and irritation. Acidic forms are the most potent but also the most irritating. You did not have pain likely because of the numbing cream. You can move to 2 mm later on, when your 1.5 mm instrument gets blunt. Dermarolling / Microneedling / Re: Interested in rolling for acne scars. I suggest a regular 1.5 mm dermaroller and a 1.5 mm dermastamp with 35 needles. Use them during the same session (every three weeks). First stamp the scars then roll the entire area. If you have lots of scars, stamp just the scars of one cheek and then roll the entire cheek. When it heals, treat the other cheek in the same way. 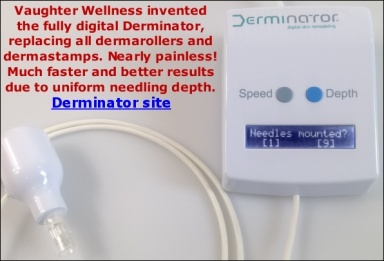 If you really have the rolling type of acne scars and you get no results in six months with dermaneedling, consider buying our suction pump. If you have just a few scars and apart from the scars the overall skin texture is good, buy just the dermastamp and not the dermaroller. The skin should turn red and you may get occasional pinpoint bleeding (not everybody does). You should keep the treated areas moisturized with a cream that you know from your experience does not break you out. This is very individual and what breaks out one person does not necessarily break out the other so I tend not to give any advice here and you have to use your own experience. Have you used Chloramine-T to sterilize the cartridge? If yes, then we'll stop recommending using it again for DermaJet needle cartridges and we'll send you a replacement. Please email me the pictures. Yes, with the 1.5 mm, every three weeks. Frequent rolls with shorter needles are especially useful for hyperpigmentations, general improvement of skin texture or acne prone skin and you do not seem to have a problem with that. You can start rolling with a 0.5 mm roller in between your rolls or wait to find out whether dermaneedling works for you and add it later. Thank you so much for your forum posting about your experience! I have emailed you. If you are very prone to hyperpigmentation, it can happen but the color will eventually disappear. There are so many variables that it is really impossible to design a make perfect general skin routine that fits everyone. Lots of info concerning various skin conditions can be found on our forum. The single needles proved to be the best instrument for the wrinkles in between the eyes – the so called 11's but you can also use your 1.5 mm dermastamp. Use the dermastamp on the acne scars but since it is on the neck, do not insert the full length of the dermastamp needles. Puffy skin is usually water retention (the puffiness improves and worsens). If the puffiness is the worst in the morning, use a thicker pillow (if you can handle it) and apply cold compresses in the morning. Dermaneedling cannot fix dimples or folds that appear when smiling. For the wrinkles on the forehead and for the sagging skin, use your 1.5 mm dermaroller (on the wrinkles, you can also add the dermastamp). For the time being, do not buy more dermarolling instruments. Try what you have and if it works for you, you can add more later. By that time you will know if you prefer dermastamping or dermarolling etc. On your back your skin is thicker so you'd need slightly longer needles for the same results. We mention in the text in our YouTube video on the DermaJet that we do not know what that ghee-like solution is (we did not make those videos and the manufacturer who gave us the clip also doesn't know what that clinician used) but we already remarked recently here that you can basically use any cream or ointment, as long as it is compatible with open skin and you clean the needle cartridge of it thoroughly afterwards, if you plan to reuse it. "Dirty" looking skin is usually unevenly distributed melanin pigment (some areas of skin have excessive levels of melanin). Melanin pigment is normally present in the skin and it is our natural UV filter. The darker the skin the more melanin it contains. The skin produces more melanin upon sun exposure. In certain individuals prone to hyerpigmentation, the skin unfortunately produces melanin as a reaction to skin injury, irritation, or other triggers. It seems the triggers can even be hormonal – such as chloasma in pregnancy. Microneedling will partially renew the skin and if you are lucky, the "new skin" will have more even distribution of melanin but it is not always the case. What can also help are Tyrosinase inhibitors such as hydroquinone. They inhibit the enzyme that converts tyrosine to melanin. They do not remove existing melanin, they only help preventing formation of excessive melanin in the future so you have to use them long term. Use a 0.2 mm size to enhance the penetration of hydroquinone (we do not sell hydroquinone). Please read the leaflet that comes with the hydroquinone because it can have side effects. The serum has the same concentration as the mask.